Lionel Messi (R) leads celebrations against Manchester United. 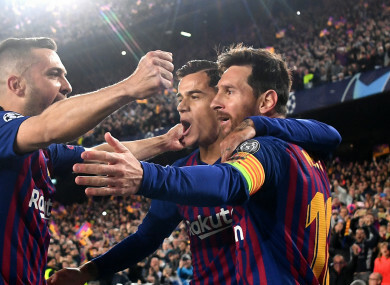 LIONEL MESSI BELIEVES Barcelona have taken a “small step” towards winning the treble after dispatching Manchester United in the Champions League quarter-finals. Messi scored twice in a 3-0 win at Camp Nou on Tuesday that secured a 4-0 aggregate victory over Ole Gunnar Solskjaer’s United. With a nine-point lead at the top of LaLiga and a Copa del Rey final with Valencia to come, Barca are on track to repeat the treble they last won under Luis Enrique in 2014-15. And Messi wants the domestic title race to be wrapped up sooner rather than later to boost their chances of conquering on all fronts. “As I said, I’m happy for the win,” he told Movistar. We’ve taken a small step [towards the treble]. We have to think about LaLiga and try to be champions as soon as possible. Barca’s win came as Juventus were stunned by Ajax in Turin, the Eredivisie side claiming a 2-1 victory on Tuesday and a 3-2 triumph on aggregate. The result was cheered by home fans inside Camp Nou, with Ajax having knocked out holders Real Madrid in the last round before seeing off Juve and Cristiano Ronaldo. Messi believes such results highlight how difficult it can be to win the competition. It tells you everything,” he said of the Juve defeat. ”They’re the best. It’s going to be tough. Email “Messi hails Barcelona's 'small step towards treble'”. Feedback on “Messi hails Barcelona's 'small step towards treble'”.